Featuring 18 of London's finest jazz instrumentalists, along with our singer, Talia Cohen. Talia has played at the likes of Ronnie Scott’s, Scala, the Hippodrome Casino and has worked with an array of musicians and producers recently including Turner Prize nominee James Richards. 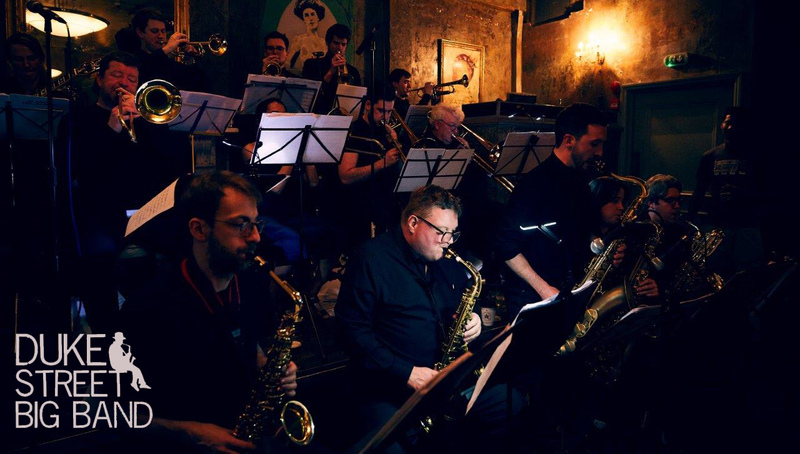 The Duke Street Big Band is one of London's premier big bands. Founded in 2011, the band was set up to bring Jazz and big band music to a wider audience. When they are not playing at private parties you can find them at venues across London from The Crypt in Trafalgar Square, The Water Rats, The Dublin Castle to the Toulouse Lautrec Jazz Club. "[Talia Cohen] is London's answer to Ella Fitzgerald"
Independent artist Emma Lauson writes catchy acoustic guitar-based songs with the hooks of pop music and warm mellow vocals that aim to deliver a positive message. Having taken her ‘Uplifting Singer-Songwriter Set’ to festivals last summer, and won various song writing awards along the way, ‘Reach Out’ EP Launch will be an evening of heart-warming songs old and new in a celebration of Emma Lauson’s best music. Emma has invited several of her co-writers to perform tracks they have written together. With the creativity and spark that old friends on a stage ignites, this celebration of shared music making promises to be a memorable show for lovers of well-crafted original music. Emma Lauson – Emma Lauson (singer-songwriter/vocalist/guitarist) is an up-and-coming independent solo artist. 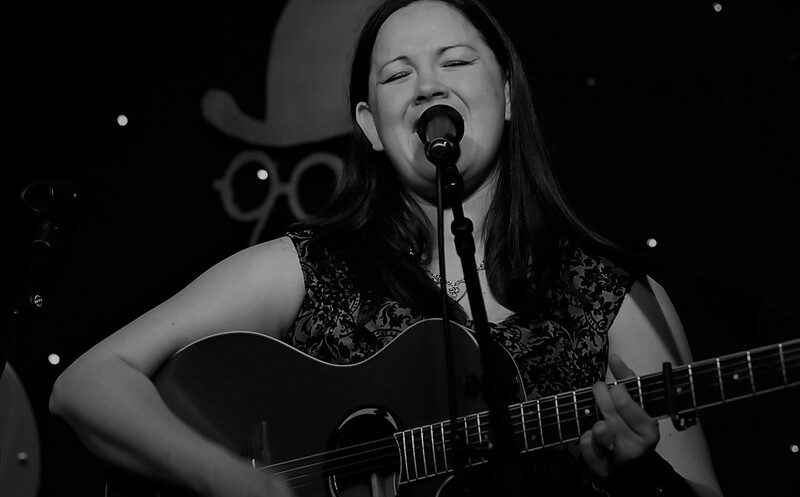 She has earned her musical stripes by gigging her original songs at festivals and on the London busking scene. A self-confessed ‘serial songwriter’ she loves to write new songs on her acoustic guitar but has also performed at Birmingham Symphony Hall as a soprano and shared a stage with Hollywood and West End musical star Renee Montemayor. She has had her music appreciated by international judges in the UK Songwriting Contest and Masters of Songwriting competition as follows: My Head’s A Mess (music and lyrics by E. Lauson) UK Songwriting Contest 2018 Highly Commended in the singer-songwriter category; Velvet Nights (lyrics by E.Lauson) UK Songwriting Contest 2017 Finalist in the lyrics category; Masters of Songwriting 2018 Finalist for entering Lights Camera Action (music and lyrics by E.Lauson/M.Adams/M.Andreou/C.Symons) and Velvet Nights (lyrics by E. Lauson, music by J. Kelson). Martyn Adams - Also known as Emma's 'partner in rhyme' Martyn (songwriter/guitarist) has co-written with Emma on several songs, including her EP title track 'Reach Out' and award-winning song Velvet Nights (UK Songwriting Contest 2018 finalist). He is no stranger to the stage, as formed part of the band that Emma took with her to the Masters of Songwriting 2018 finals, and together won trophies for the performances of Lights Camera Action and Velvet Nights. Surrey-based Martyn also performs in his own band, Nightingale Road, and is a published author, with his compilations of short stories, Godalming Tales and Godalming Tales Volume 2, currently available in Waterstones. "It’s so catchy I only heard it once and the chorus is stuck in my head.... Congratulations Emma!!" "Emma you are such an inspiration. Keep inspiring!!"